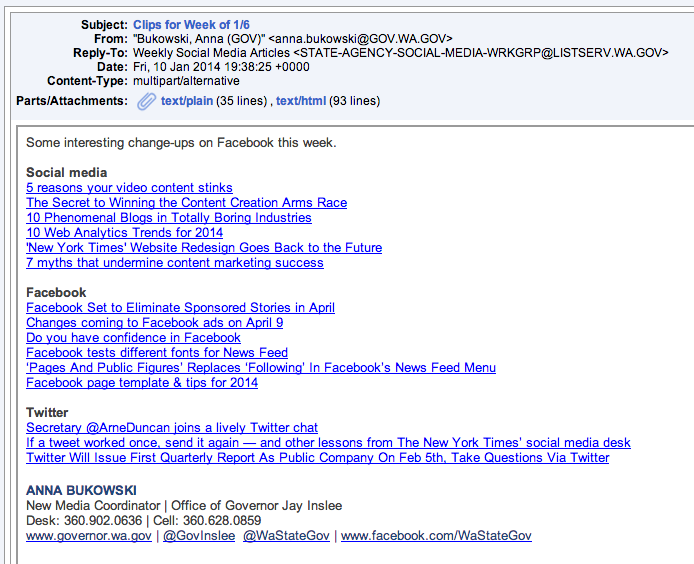 Anna Bukowski, new media coordinator for Governor Inslee, compiles and sends a weekly digest of social media news. (Click the image on the right to see an example.) If you’d like to get this delivered straight to your inbox, join the listserv. You’ll have full access to the archives once you join. Anna also oversees the Social Media for State Government Professionals group, which meets monthly to network and discuss social media trends. If you work in a state agency, board or commission and are interested in joining, email Anna to be added to the email list (anna.bukowski@gov.wa.gov).